SSDs are quickly replacing mechanical, magnetic hard drives thanks to their speed, ruggedness and lightweight, compact form (among a host of other reasons!) Because SSDs are relatively simple to set up, most new users don’t put much thought into long-term care. Unlike magnetic drives, fragmentation isn’t going to hurt your SSD’s speed. In fact, fragmentation is a requirement for maximum SSD performance! 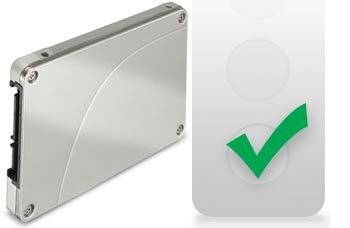 SSD controllers can access multiple channels simultaneously. This means that sprawling data across several flash chips allows your SSD to access information with more speed, instead of slowing it down. Defragging your SSD is not only unnecessary, but it could shorten the life of your SSD. SSDs have a lifespan that’s determined by how much they’re used. While it’s designed to last much longer than you’ll ever need it, defragmenting your SSD involves writing data unnecessarily, which will shorten your SSD’s lifespan. OS X and Windows should both be able to detect when an SSD is in use and turn off defragmentation automatically, but just in case be sure to check that the auto defrag option in your OS of choice is turned off. SSDs offer uncompromising speed, making them the ideal choice for operating system files and other programs that must be accessed frequently and quickly. However, due to size limitations and cost-per-gigabyte, SSDs are less efficient for storing large or seldom-used files that simply take up space. If you require a large amount of storage for archiving purposes, optical drives and Blu-ray recordable media provide a scalable and low-cost solution. When a block is written to, the entire block must be erased before it can be used to store new data. But the process of erasing blocks can slow the SSD’s performance if it’s managed on the fly. TRIM is a command that extends the life of your SSD by preventing the drive from overusing certain blocks. The command does so by stepping in a little ahead of time and instructing your operating system (supported by Windows 7 onward) to erase the blocks that are no longer considered “in use” and can be wiped internally. Windows 7 and 8 should detect an SSD and enable TRIM automatically, but it’s a good idea to check anyway. Old operating systems like Windows XP and Windows Vista don’t include support for the TRIM command, leaving deleted file data on your drive. Unerased sectors slow down performance, forcing your operating system to first erase the residual data before writing a file into the free space. Dropbox replacing the Hard Drive? This entry was posted in Secure Storage, Solid State Drives, Solid State Drives (SSD) by DIGISTOR. Bookmark the permalink.